The purpose of this chapter is to analyze the cultural issues in employee engagement. This chapter covers the importance of employee engagement and diverse workforce. 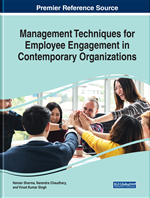 The author focuses on the role of culture in employee engagement, and it shows a positive relation between the organization performance and employee engagement. In this chapter, the author also depicts cultural issues in the organization. In the end, the author emphasizes the techniques to improve the cultural issues to enhance employee engagement. Today’s management approach has been changed, Human Resource Department do lots of activity to engage, to enthuse and to excel the employees toward task. Famous organisation like Apple, Microsoft, Google and other companies follow the activities to build employee relations. Affection, Love and Cohesiveness are the social need of anyone’s. Today’s Human resource Department focuses on this social need to make a strong bond between the employer and employee. Today’s world is digital world; thought processes and actions are continuously changing to face the challenges in this competitive world. Employee engagement is not tangible thing by which any organisation predicts the requirement of the employee by one touch, all employees are alike, degree of engagement will be different, and employees themselves will be responsible of own level of engagement. Companies have their own strategies to make employees engaged at a work place. These strategies may vary companies’ polices and work environment. According to the Gallup great work place award 2015; many popular companies who maintain the great workplace and environment to involve the employee into a work. ABC Supply Co., Inc, Indus Towers, Adena Health System and many more companies proved that engagement plays a vital role in the performance of the organisation. On above, Google, American Express, John Lewis, Hyatt, Southern Airlines and Virgin are on the top of the list of employee engagement. These companies focus on different approaches i.e. transparency, behaviour, listening to the employees, etc. With advancement and enhancement in the usage of technologies, and the growing need to globalize organizations, industries are going across the national geographical boundaries and expanding the scope of their business dealings. Once a concern is globalized, the need for the search of the best person to carry out the respective tasks emerges. Now, that is something opening up new opportunities for candidates across international boundaries; making these boundaries thinner and gradually eliminating it as a criterion for choosing a job. As we see these days, the supremacy of Multi-nationals is sprouting; and so is the need to have different people from various countries and cultural backgrounds. This cultural mix is a boon to any organization in terms of new ideas, unique creativity, increased exposure, foster innovation, richer brainstorming and better customer understanding and decision making; but the same gives rise to a number of cultural issues in the organization too, like- the unclear culture, resistance to changes, vague assumptions, reduced communication, and the list continues. Employee engagement has become a crucial topic in the organisation to compete in the market, it is necessary to having highly engaged employee at a workplace.